“Why’d you do that?” Connor asked. 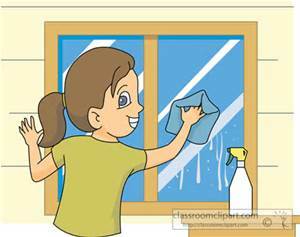 “’Cause washing windows is about the most fun thing you can do on a summer morning. You get to spray water, and no one will yell at you. Then you get to use these cool window-cleaner bottles, see? “Well . . . What’ve you got?” Spike questioned. “I have almost a whole pack of gum,” Blake offered, taking the gum from the pocket of his tan shorts. Connor and Blake grabbed the cleaning supplies and started on the next window. Spike took out a piece of gum and popped it in his mouth. Then he stood back, chewing the gum and watching the other two. “There’s a streak right there,” he pointed out to Blake. Just as the pair finished wiping the window, a girl named Madison came by to see what was going on. After paying Spike a quarter, she joined the other two at the next window. Before long, there were five little kids washing the windows. Spike was feeling pretty pleased with himself. This was the best plan he’d ever devised. The windows were being cleaned by little gnomes, and he was free to do whatever he wanted. Maybe he would take a nap or watch TV. “Michael David Smith!” His mother’s voice made him jump. “I . . . I . . . I thought you were working in the church office?” Michael stammered. “I wouldn’t exactly say that,” Spike said to his mom. “But I paid him a quarter,” Madison whined. From The Handy Helpers: Red, White, and . . . Bloopers!